See you June 7 - 9th! Arts & Crafts Vendors and Food Vendors on Town Hill and the Boardwalk 10:00 a.m.
Grand Feature Parade around noon on Colonial & Washington Avenues. The theme for 2017 is "Virginia Is For Lovers"
Parade Awards Ceremony on Town Stage 2 p.m.
Boat Parade 1 p.m. Great views of the parade from The Riverboat's outdoor deck! Live bands all weekend at High Tides and Dockside restaurants/tiki bars. 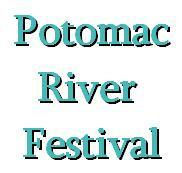 The annual Potomac River Festival is in its 68th year in Colonial Beach. It's a weekend-long event in mid-June with fun for the whole family. The gentle river breezes and warm sunshine make for a great time as you take in all the fun-filled events, sights and sounds of this wonderful event, sponsored by the Colonial Beach Chamber of Commerce. 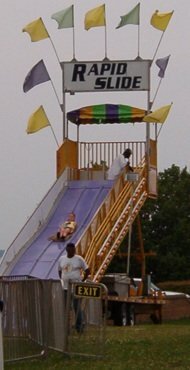 There's a Carnival that usually arrives on the Wednesday before Festival weekend. More video clips can be found on our YouTube Channel. The Miss Colonial Beach Pageant also takes place during the Friday evening festivities, typically right after the parade. 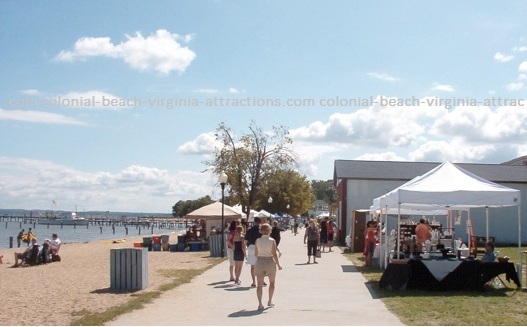 Vendors on Town Hill and along the Boardwalk open their booths at 10:00am until 5:00pm. You'll find various vendors with all sorts of wares such as clothing, food, art, jewelry, wood sculptures, yard ornaments, furniture, antiques, sewn items, dolls, candles and other knick-knacks. Here's a tip: Buy it when you see it, because if you come back for it later, you won't be able to find it. DJ on Town Hill provides music for your listening pleasure. Heck, you can even get up and dance if you feel like it. Oftentimes, line dancing will take place and it's a blast! Grand Feature Parade and entertainment and is so much fun! You'll see some great groups and floats as they make their way through the streets from their beginning point, usually at the High School. Sometimes there's a Majorette competition on the schedule, too. Sometimes live bands on Town Stage provide the music for an enjoyable afternoon and evening concert. A grand display of Fireworks cap off a great day of festival fun and usually begin at 9:00pm. Get there early as the beach area fills up quick! There's always a good turnout for this event because Colonial Beach always puts on a great fireworks show. I sometimes park near the BB&T bank branch and walk a few blocks. It's a good idea to bring chairs or a blanket to set down - especially if you're in the sandy part of the beach area. A flashlight is also helpful. The vendors usually open their booths at 10:00am and will last until 4:00pm. Colonial Beach Yacht Club puts on a Boat Parade travels from Monroe Bay up past the Town Pier, to the Riverboat and back. 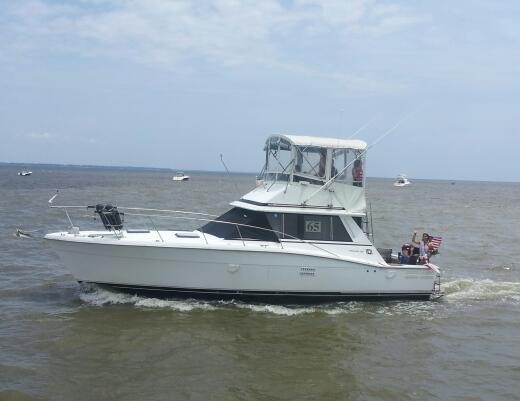 Get your cameras ready for all the beautiful boats as they float by. parade theme: Hometown Heroes The Miss Colonial Beach pageant was rescheduled to Saturday, June 8th due to a tropical storm. The Friday night Firemen's Parade was moved to Saturday and was a part of the Grand Feature Parade.